The king penguin (Aptenodytes patagonicus) is the second largest species of penguin. In size it is second only to the emperor penguin. There are two subspecies – A. p. patagonicus and A. p. halli; patagonicus is found in the South Atlantic and hallielsewhere. King penguins eat small fish, mainly lanternfish, and squid and rely less than most Southern Ocean predators on krill and other crustaceans. On foraging trips they repeatedly dive to over 100 metres (330 ft), and have been recorded at depths greater than 300 metres (980 ft). King penguins breed on the subantarctic islands at the northern reaches of Antarctica, South Georgia, and other temperate islands of the region. The king penguin stands at 70 to 100 cm (28 to 39 in) tall and weighs from 9.3 to 18 kg (21 to 40 lb). Males are slightly larger than females. The mean body mass of adults from Marion Island was 12.4 kg (27 lb) for 70 males and 11.1 kg (24 lb) for 71 females. Another study from Marion Island found that the mean mass of 33 adults feeding chicks was 13.1 kg (29 lb). Thus the average weight of the king penguin is similar or just slightly higher than that of the largest living flying birds. The plumage of the king penguin is broadly similar to that of the closely-related emperor penguin, with a broad cheek patch contrasting with surrounding dark feathers and yellow-orange color at the top of the chest, however the cheek patch of the adult king penguin is bright orange whereas that of the emperor penguins is white, while the chest orange tends to be more vivid and less yellowish in the king species. Both species have colorful markings along the side of their lower mandible, but these are pinkish in emperor penguins and orange in king penguins. Emperor and king penguins do not occur together in the wild typically, with the possible exception of vagrants at sea, but the emperor can readily be distinguished by being noticeably larger and bulkier. Once fully molted of its heavy dark brown down, the juvenile king penguin resembles the adult but is somewhat less colorful. 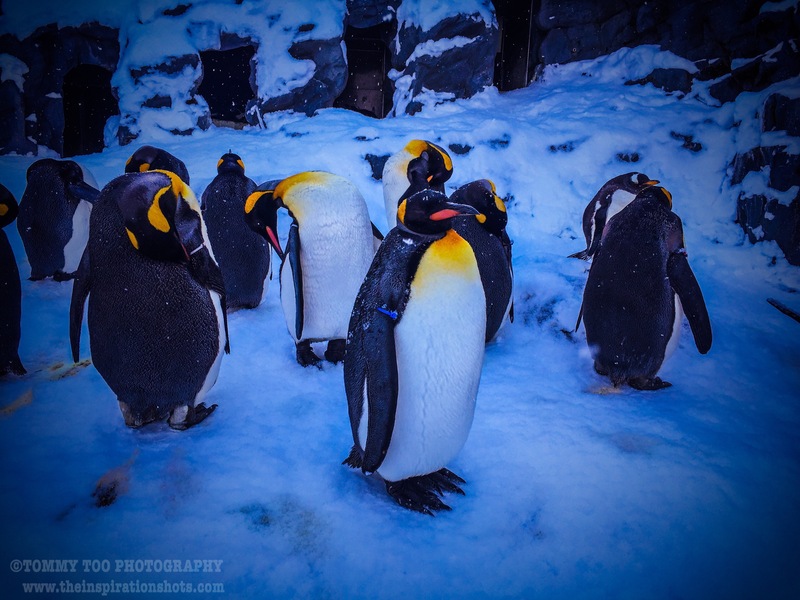 King penguins often breed on the same large, circumpolar islands as at least half of all living penguins, but it is easily distinguished from co-occurring penguins by its much larger size and taller frame, distinctive markings and grizzled sooty-grayish rather than blackish back. The word penguin first appears in the 16th century as a synonym for great auk. When European explorers discovered what are today known as penguins in the Southern Hemisphere, they noticed their similar appearance to the great auk of the Northern Hemisphere, and named them after this bird, although they are not closely related. The etymology of the word penguin is still debated. The English word is not apparently of French, Breton or Spanish origin (the latter two are attributed to the French word pingouin “auk”), but first appears in English or Dutch. Some dictionaries suggest a derivation from Welshpen, “head” and gwyn, “white”, including the Oxford English Dictionary, the American Heritage Dictionary, the Century Dictionary and Merriam-Webster, on the basis that the name was originally applied to the great auk, either because it was found on White Head Island (Welsh Pen Gwyn) in Newfoundland, or because it had white circles around its eyes (though the head was black). An alternative etymology links the word to Latin pinguis, which means “fat” or “oil”. Support for this etymology can be found in the alternative Germanic word for penguin, fettgans or “fat-goose”, and the related Dutch word vetgans.